Germ warfare: What can you do to help battle hospital-acquired infections? As a nurse, you see all too closely the effects of our ongoing battle with hospital-acquired infections (HAIs) and antibiotic resistance. And the stakes have never been higher. In the Fall 2014 issue of Scrubs, we armed you with evidence-based steps to take at home and at work to prevent the spread of infections and curb antibiotic resistance. Now, check out more on our war against germs…and what you can do to help win it. Should fresh flowers be allowed in hospitals? Could these two products reduce the spread of germs in the hospital? 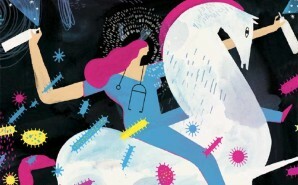 Flu season factoids that shock even nurses!